The Writers’ Program also offers several Specializations that are made up of three or four courses designed to give students a quick burst of knowledge on a specific topic. Specializations carry many of the same benefits as certificates and require only a modest application fee. The art of short fiction offers readers sharp insight into characters’ lives through compression, description, and evocative details. Contemporary literature is alive with masters of the form, including Alice Munro, George Saunders, Jhumpa Lahiri, Lydia Davis, Junot Diaz, and many others. This 3-course Specialization provides students with an intensive approach to both generating new work and revising it in the collaborative environment of a workshop. 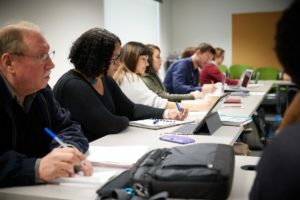 Over the course of three quarters, students receive dedicated instruction on the form of the short story, with directed readings of its best examples. At the conclusion of the three courses, students will have three completed stories and two additional stories in-progress. It is said that all of us have locked inside at least one good story to tell. Through lectures on craft, short writing exercises, assignments, and discussion, you learn how to tell yours. Topics include plot, point-of-view, setting, description, conflict, characterization, dialogue, tension, rewriting, and submission strategies. The course goal is to draft and revise at least one short story. This course is a prerequisite for students who are continuing in the short-fiction sequence. 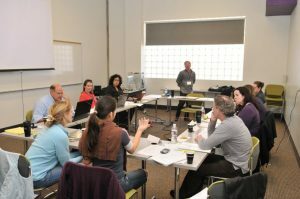 This UC-transferable workshop covers the key elements of fiction writing, including plot, characterization, setting, point-of-view, and various story development techniques, as well as publication markets. Your goal is to complete or rewrite three stories of average length. Focusing on close textual analysis and intensive writing practice, you create two short stories and revise one in this 10-week workshop. Weekly lectures on technique, analysis of published stories, and in-depth instructor and peer critique develop and deepen your understanding of the art and craft of short story writing. Strategies for approaching the marketplace also are discussed. The short story, one of the most challenging of all literary forms, requires the precision and imagistic intensity of poetry combined with novelistic elements of structure, setting, and characterization. This workshop helps you to realize your fictional intentions through detailed written critiques and to prepare your stories for publication in targeted markets. The course goal is to complete two new stories and one revision. Enroll here or contact a Writers’ Program advisor at (310) 825-9415 or writers@uclaextension.edu. Acceptance to Master of Fine Arts programs in creative writing can be fiercely competitive, with some programs receiving hundreds of applications for just a handful of spots. Most schools look very closely at applicant writing samples to determine if the student is both prepared for graduate study and a good fit for the faculty in their program. Our Specialization in MFA Application Prep offers potential MFA applicants an opportunity to polish their writing sample with some of the best writers in Los Angeles. Take your writing through several stages of revision before submitting it as part of your application materials. A final course will help you craft your personal statement and determine which MFA programs and faculty suit your needs, passions, and aspirations. Our most advanced short story course will help you craft and finish at least one complete story in a workshop environment with other highly motivated writers. Acceptance to this class is by application only. In this course, every student comes in with a strong draft of a story in progress and goes through two rounds of comments and revision. The goal is to have a publishable piece by the conclusion of the quarter that is appropriate for use as an MFA Application work sample. With nearly 400 MFA programs nationwide, it can be challenging to determine which programs suit you best. Learn about various program models from guest speakers to narrow your list of top choices, and work with our experienced instructor to finalize your personal statement, identify your recommendation letter writers, and complete your application. Students receive an Award of Completion from UCLA Extension and a one-on-one consultation with a Writers’ Program instructor on up to 25 pages of their MFA application writing sample. The UCLA Extension Writers’ Program partners with local MFA programs to waive application fees for some students. Click here to enroll or contact a Writers’ Program advisor at (310) 825-9415 or writers@uclaextension.edu today for more information. For aspiring TV writers, winning a network fellowship is one of the quickest ways to get staffed on a show for the first time. These competitive programs require stellar writing samples and a solid understanding of the culture and procedures of a writer’s room. This Specialization consists of four courses and takes you from concept through execution to help you develop both a spec and a pilot in either comedy or drama. The Specialization can be completed in two to four quarters, depending on individual schedules and goals. Approximately $1975 plus $50 Specialization candidacy fee. This specialization gives aspiring filmmakers a quick route to go from concept to completion. Two courses in screenwriting teach you the basic skills you need to write your script, and two courses in directing set you on the path to making your cinematic vision a reality. This series is great for people completely new to filmmaking, or experienced artists in one area who want mentorship in the other. *This program is open admission. The Application & Candidacy fee establishes your candidacy in the certificate for a period of time covering normal progress toward completion and allows you to access a variety of program benefits.